I wanted easy stuff to please me, something in the dark began to squeeze me. The repressed desire for something more is visually resolved by re-experiencing what you now see. Opening sequences…and the loneliness gets blown away. An expression of a feeling as real in spirit as the cinematic coordinate of La Nouvelle Vague, Dan Black’s (tip of the U.K.’s Wonky Pop spear) music video for “Symphonies” strides through bunches of title sequences we’ve grown up with. A few of these dawning moments include a Lynchian/Cardiffian lost highway, the neon of Tron, and a Saul Bass speedboat. Black -himself a cross between Ferris Bueller and Sonny Crockett- slides and drives under his lyrics, themselves playing the supporting role of credits. This glorious primal therapy, this dual coronation of sorts, is brought to us by Paris-based Chic & Artistic. We would just like to add that this study of title sequences en masse becomes coldly, fascinatingly recontextualized. Lopped from the body of the film and gathered as they are sometimes bears us an odd guilt. Work like this, a blowtorch of invention, keeps us on. You too. A discussion with CORINNE BANCE and AXEL D’HARCOURT, the multi-talented duo that make up Chic & Artistic. Your petite reproductions of classic and cult titles are beautiful. Tell us about your love for title sequences. C&A: Attaching great importance to the graphical aspect of films in which we’ve already seen, we are always very sensitive to their title sequences. No matter what level of quality a film has, title sequences always give us an impression of the film and its spirit, an essential taste that plunges the viewer into a movie. What gave you the idea for the video? “Symphonies,” the song, is a mix of Dan Black, between a Rihanna beat and the musical theme of the 1980′s John Carpenter film Starman. The spirit of Black’s composition and lyrics are very cinematographic, so it seemed logical to link it to cinema. This brought us to the idea of a video clip in which Dan Black, in a series of title sequences, pays tribute to the legendary 7th art. The song’s subject is the desire for a less ordinary life, and the music and film titles share something magical, an introduction which keeps us in suspense. We loved the idea of a movie that never starts, passing from one title sequence to another, without the film in the middle, as if the title sequences in themselves were enough to tell a story without the film. The idea of using the title sequences also allows for an immediate recognition of the film genre. How did you arrive at the specific title sequences used in the video? The title sequence selections we made is a combination of our artistic preferences and those of Dan Black, in order to develop a story in which he goes from adventure to adventure, universe to universe. To make our selection, we set a main objective of integrating all time periods and all film genres, from the 1930s to today, drawing from horror films to those of cartoons. From the outset we wanted to mix the chronological order, so that we could maintain a great level of surprise throughout the video clip. We wanted to give the impression that Dan travels through a large diversity of films, time periods, and locations, but it was also important that it was a type of film that was consistent with the world of Dan and his inspirations. We could not use a title sequence in which he would feel uncomfortable. There are so many legendary cinematic sequences, that it was sometimes difficult to make choices. Tell us a little bit about how you were able to emulate the essence of each title sequence. We viewed a large number of title sequences by genre and time period. The Art of the Title website was incidentally very useful for us! We needed to reproduce the image and original graphic design through lighting, film grain, color grading, costume design, accessories, as well as typographical choices. We didn’t have a lot of time; one day of shooting and 3 weeks post production, with little preparation. The difficulty was not being able to use the same cameras that were used for each time period. It was therefore necessary to find tricks to emulate the essence of the original image. For example, at the beginning of the video clip, the convertible in the black and white title sequence is deliberately poorly integrated into the landscape; we can see the cinematic tricks, as if it was made in the 1950s. The title sequence in tribute to Tron reflects an 80s image with somewhat runny to washed out colors. The differences are quite visible from the beginning to the end of the video clip, so that we have a distinct impression of going from one universe to another. Dan Black’s song has a comforting depth to it. It is complex, accessible and fun. Did you take any cues from the quality of Black’s lyrics? Yes, completely. “Gimme, gimme more than life I see…” is one of the lyrical highlights that had much inspired us during our reflection, the idea that Dan searches for another life, one elsewhere, in a world of fiction. The lyrics are very present in the clip, as they often become movie titles. Furthermore, it was amusing to keep only part of a phrase and transform the meaning, to give a new connotation to the lyrics. Did you learn any tricks from designing a “cut and pasted” aesthetic? It was a very interesting experience, a little like scientists trying to reproduce experiments, adding new things to it, and using it as inspiration to make them evolve. These experiences have already given us ideas for other videos. For us, the general tribute that we wanted to give to the movie title sequences needed to flow as if all the sequences, edited piece by piece, made up a fluid partition all together. To do this, we tried to work particularly on the transition of each sequence so that the changes of time period flowed harmoniously, transporting Dan Black with the rhythm of the song. Since each title sequence in this video clip is different, we could say that each title sequence holds a story in our eyes. And it’s true, without revealing all of our production secrets; we think they all have something special. For example, in the tribute to 2001: A Space Odyssey, the background of the inside of the vessel is actually an image of the inside of a washing machine. We filmed the images of the title sequence “New Wave” without authorization, camera on shoulder, as did directors from that time period. Something that was interesting about this clip was to work one day on a science fiction, another on a silent movie, moving from a cartoon to a western. Concerning Dan, we decided that he should not be too “active” in the title sequences, so that his presence wouldn’t be ridiculous or overplayed, but in tune with each universe, in perfect harmony. In speaking about harmony, it may not necessarily be obvious at first sight, but Dan is dressed the same throughout the entire video clip, even when his image is changed graphically into an animation or to a marionette in the spirit of Thunderbirds. However, sometimes he wears accessories like a Sheriff’s star, or a pair of glasses, to help him blend into the title sequence better. Did any part of the process take you by surprise? The order of certain title sequences seemed somewhat improbable on the storyboard. Nevertheless, the final result seemed generally fairly homogeneous despite the challenge of trying to coincide title sequences, which were very different from each other. Did Dan take part in the conceptualization of the video? As with all of the videos we have done for him, Dan is always very involved, from the idea to the realization of it. For this video, he was particularly involved in the selection at the outset, because it was necessary that each type of film corresponded to him. Since the beginning of his new album “((un))” (we also worked on the graphics and photos for the album) he wanted to do something cinematographic. By the way, he owns a book on film title sequences. Would you give us a few of your favorite elements of this sequence and tell us why they are special to you? 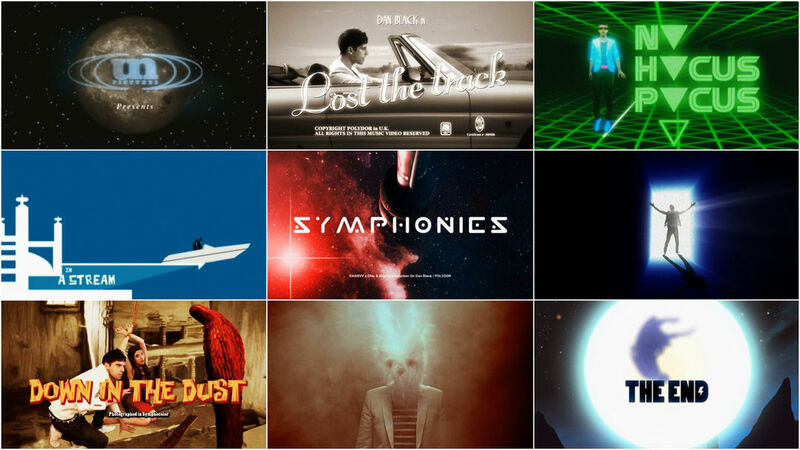 There are some that we love because they pay direct homage, and we hope to have succeeded in recreating these legendary title sequences, like those of Saul Bass, Goldfinger or that of Se7en. There are others that we also love because they have less obvious references and raise doubt about their original models. That fact is that they were all interesting to work on. We find it interesting that, until this video, we have never done a title sequence in a film. We would love to make a real one now, so if a film director reads this, don’t hesitate! Is there a modern artist whose work inspires you? There isn’t one; there are evidently a 1,000 varied artists whose work inspires us: writers, filmmakers, musicians, artists… from Bret Easton Ellis to David Lynch, Radiohead, or Mattew Barney… we like all existing media. That said, the director Michel Gondry is an irrefutable model for us, by the proliferation of his ideas over the years, from video clips to cinema, and by his notable willpower to give meaning to graphical concepts, as otherwise seen in director Sean Ellis’s film Cashback. The creative multi-talented Kuntzel & Deygas duo inspire us a lot as well, through their ability to create very eclectic things in the field of graphics or design, in a multitude of projects, to the point of being contacted by Steven Spielberg in person for the title sequence of Catch Me If You Can. We are also waiting for Steven to call!